In India, the preferred mode of transportation for many is two-wheelers owing to their affordability, speed and mileage. Under the Motor Vehicles Act, 1988, it is mandatory to have at least a third-party liability policy for any two-wheeler. In light of the number of vehicles on Indian roads, the government introduced this rule to ensure that at least third-party expenses were covered in case of accidents. There are a number of insurance providers offering adequate coverage at affordable premiums in Bhopal. 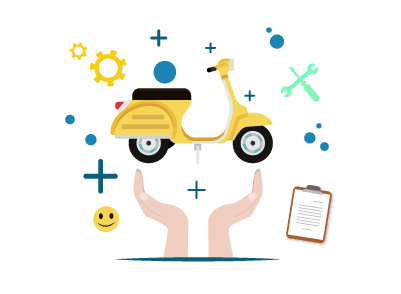 Choosing the best insurance policy for your bike in Bhopal can leave you confused because of the many options available in the market. The best policy is relative to your requirements, the coverage you want and the premium you are willing to pay. Some of the popular insurance companies in Bhopal that offer motor insurance for two-wheelers have been listed below. In your welcome kit or insurance policy document, there should be a list of cashless network garages. The customer care service will be able to provide you with assistance in finding a cashless network garage. On the official website of the insurance company, there should be an option available to help you locate a cashless network garage. Simply enter your location to find garages nearby. The most important benefit of cashless garages is that the paperwork is handled by the garage and the bill is settled directly by the insurer. The customer has a very small role to play in this process therefore reducing the time taken and the hassle involved. Apart from this, customers can benefit from a number of other features of cashless garages in Bhopal. Eliminates Branch Visits - The customer is not required to visit a branch to collect the reimbursement. The customer can contact the insurance company through the customer care. Once the claim is approved, the garage and the insurer will handle the rest between themselves. Less expenses for the customer - Once the claim has been approved, the insurer will pay what is due to the garage. The customer will be required to pay only what the insurance plan does not cover. This will be a significantly lower amount compared to the entire bill. Fast approvals and settlement - Since the garage and the insurer are partnered together, they will already have information required about each other and easier contact channels. The settlement process is usually much faster through this method. Coverage Options - There are two types of coverage available under two-wheeler insurance: liability-only policy or a comprehensive package. A liability-only policy the basic legal requirement of insurance for every two-wheeler. This type of policy covers only expenses incurred in third-party damages to people or property. Comprehensive cover includes expenses incurred in damage to self and own property as well as third-party liabilities. Premiums - Premium is the amount that has to be paid to purchase the plan. Look out for options on premium payments and terms. Premiums for two-wheelers are usually a single payment for an annual policy. The premium will have to be paid again at the end of the policy term if you wish to renew it. Plan Terms - Terms available are usually one year and up to 3 years. Opting for a longer term can safeguard you against rising premiums on third-party insurance. Cashless claims - If your insurance provider offers cashless settlements, you will not be required to pay from your own pocket for the repairs. Cashless claims settlements save a lot of time, reduce the hassle and out-of-pocket expenses. Deductibles - Deductibles is the amount you will have to pay in case of a claim. If you choose a 10% deductible, the insurance company will pay only 90% of the insurance claim. Opting for a lower deductible will increase your premium, but when it comes to making a claim, the insurance company will be liable to pay for a larger portion of the bill. Selecting a higher deductible will reduce your premium, but in case of a claim, you will have to pay a higher amount. Exclusions - Insurers stipulate certain events under which the insurance claim will be void. Some of the common exclusions of two-wheeler insurance plans are driving without a valid licence, driving under the influence of alcohol or drugs, damage due to war, terrorism or nuclear-related incidents, consequential losses, gross negligence in case of theft, and so on. No-Claim bonus - A no-claim bonus (NCB) is given to customers who do not make a claim during the policy period. The NCB is a discount on premiums when the policy is renewed. NCB is 20% for the first claim-free year and subsequently increases to 25%, 35%, 45% and 50% maximum. NCB cannot be transferred between policyholders. Limits on claims - Check how much the insurance provider is willing to pay in case of a claim. With comprehensive cover, the caps are dependent on the sum assured, premiums paid and coverage selected. For death caused to a third party, there is usually no limit. For claims on damage to third-party property, the insurance amount is capped at Rs.1 lakh. If you have chosen to sell your vehicle, then there is a certain procedure to follow to ensure you have no connections to the vehicle if future liabilities were to arise. To transfer the name of the vehicle to the new owner, you need to visit the Regional Transport Authority (RTO). You need to inform them of the sale of the vehicle and apply for a No Objection Certificate (NOC). Inform your insurance company about the sale of the vehicle via the customer care or visit the branch/agent. Request them to transfer the plan to the new owner. Once the new owner provides the details and documents required, the insurer will transfer the policy to the new owner of the vehicle.